Monday night we were all just downright spoiled! Carpenter, 4 Seasons and I got a shuttle at Fontana Dam to the Pittstop to grab a few resupplies and found Adam there as well. Not too long after, Long Haul and Shark Bite showed up too so we sat there for a couple hours taking advantage of the free coffee & wifi while a small storm passed over us. 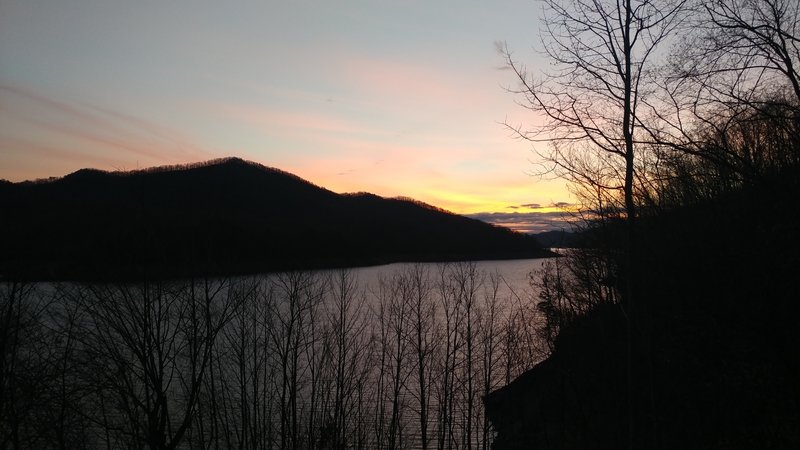 In fact I wrote my last blog post there and while I was finishing it, a sweet gentleman comes up and asks us if we need a ride back to the Dam. How lucky are we?! Mr. T was his name and he himself had completed his thru hike a few years back. Thankful for the ride, he dropped us off at the shelter but it was a mile from where the shuttle got us so there was still a mile to be walked on the AT! I dropped my things at the shelter and Shark Bite and I strolled along the mile together and back. It was a mile I’m glad I didn’t miss because it went right along the waters edge and gave beautiful views of the lake! James- BamaHiker who passed away before completing his thru-hike. Fontana is the last place he made it. 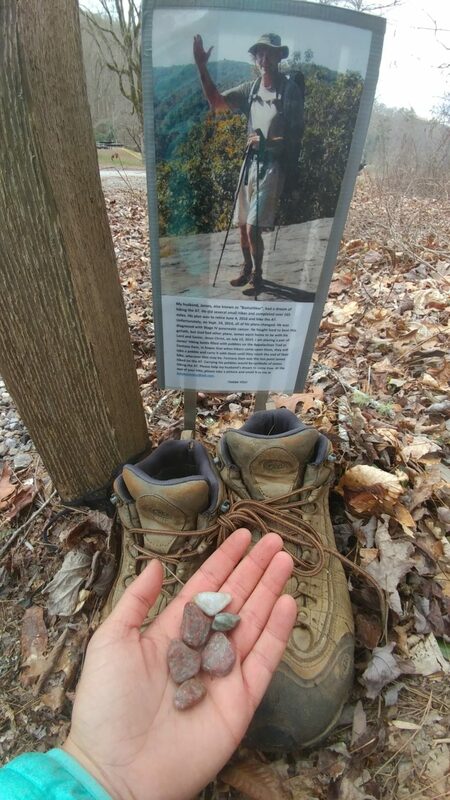 There are pebbles in his shoes and hikers are encouraged to take one and carry it to Kahtahdin in Maine to symbolize Jimmy making it there as well. I took one for everyone in our group! There were about thirteen people at the Fontana shelter that night and there was even room to spare! It is a two story shelter on each side, complete with bathrooms that have running water and wait for it……hot showers! You bet your biscuits I took advantage of that! There were also tent spots, nice fire pits and picnic tables everywhere. It really is the Hilton of shelters. The hike into the Smokies said around 10 miles to the first shelter- Mollies Ridge. But I think it’s probably closer to the 100 mile wilderness with how long that hike felt! Hungry and a little irritated, I finally made it to the shelter just before the rain started sprinkling the tin roof. Amanda, Carpenter and Long Haul were there enjoying some lunch so I joined them. After eating, the rain still hadn’t let up but we didn’t want to end our hike at just 10 miles so early in the day so we set out towards the next shelter in our first thunderstorm! I’m not sure if you’ve ever hiked in a thunderstorm, but I hadn’t until then. It took one bolt of lightning and boom of thunder and I ran screaming to catch up to the guys! They weren’t but a couple sprints away and Long Haul asked if we wanted to stay together and we so we did. We made it to the next shelter in record time, but not without the soaked clothes and muddy shoes to show for it. Since we were already drenched we decided to keep on going to the next shelter about 3 more miles away and join 4 seasons who said he was stopping there for the night. Tip: when it’s cold and wet, your clothes will not dry if you hand them up. We all learned this the next morning when we put on our soaking wet, cold clothes. But oh well, it just rained all day Wednesday too! Splashing through the mud puddles, we all trudged through the slippery rocks and roots to our end shelter for our second night in the Smoky’s. Thursday morning was COLD! I woke to the wind blowing the tarp on the shelter and ice on the Tim roof above me. Uh oh. Everything was still damp before we went to sleep and so now everything was frozen solid. I cracked my cold socks, shaking off the ice and very sadly removed my warm sleep socks from my cozy toes. The day was perfect despite the cold. 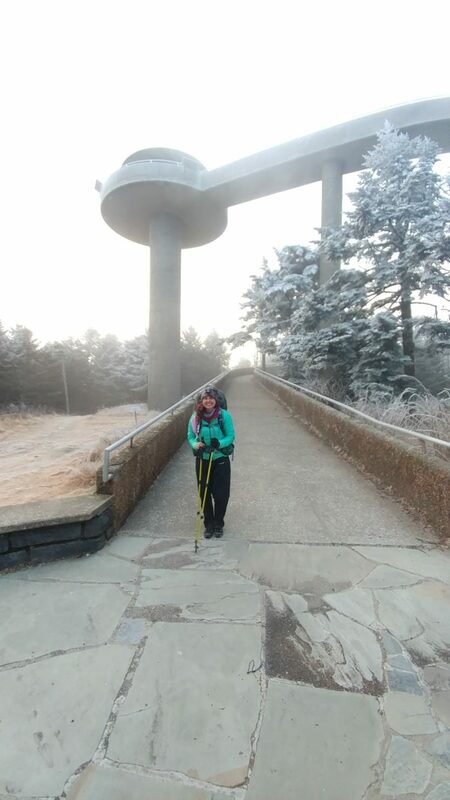 This was the day we climbed the highest point on the Appalachian Trail, Clingman’s Dome!! It was a very cold and icy climb with snow flurries blowing all over us but has been by far my favorite climb yet. 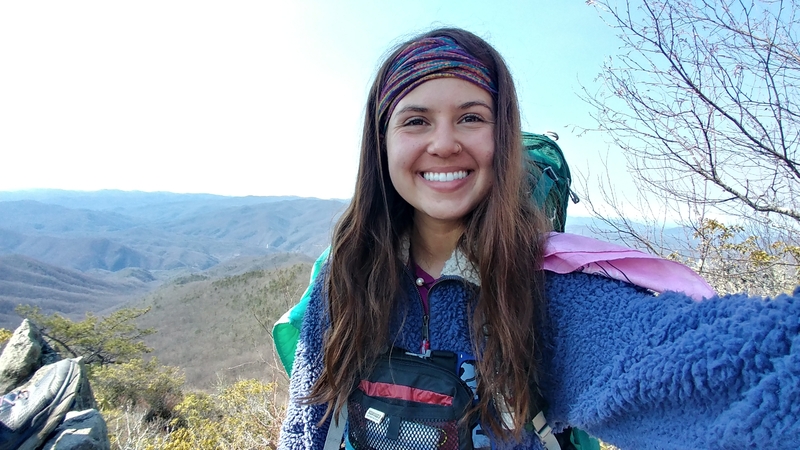 Fun fact: August 2015 was when I learned about the Appalachian Trail and a park Ranger at Clingman’s Dome was the first one to tell me all about the nuts who hike it every year! I’m so glad that I’m one of those nuts this year ? Coming down from Clingman’s was just as icy and going up and Long Haul and Carpenter took a tumble. The first of many between us all that day! I guess you could say we almost went skiing down the mountain. 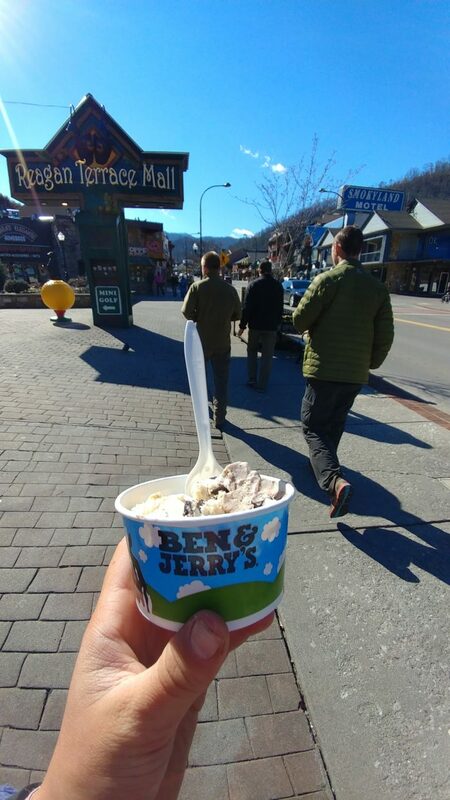 We hitched rides (thanks to Amanda) into Gatlinburg for resupply and a good meal. First things first though: food. We hit up 5 guys and destroyed some burgers and fries! Carpenter and I decided to split a hotel room because he was sick and I was just ready for a warm bed. We tried to get Long haul and 4 Seasons to stay too but they decided to try their luck hitching back to Newfound Gap and getting to the next shelter. Well about 20 minutes later 4 Seasons calls saying no one will pick them up and they stay the night with us as well. Texas Roadhouse was just a minute walk away from the hotel and that’s when we learned our hiker hunger kicked in. Rolls, on rolls, on rolls! And steak of course ? Oh and of course we got ice cream ? 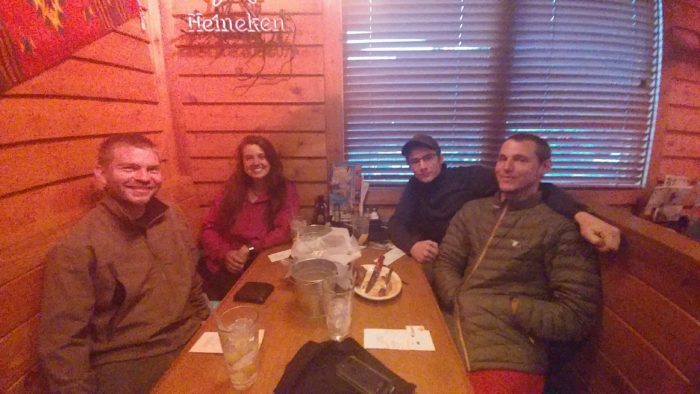 That night in Gatlinburg I posted on the AT thru-hike class of 2017 page to see if anyone knew of a cheap shuttle service or someone to take us back to Newfound Gap in the morning because everyone I called wanted an arm and a leg. We were going to hitch anyways but I figured I’d ask since the other two couldn’t get a ride the previous day. Well people were anything but helpful really. Luckily a lady- Kathy messaged me and said she happened to be going that way early in the morning! Oh lucky day ? Kathy thru hiked in 2010 and was even kind enough to offer us to stay in her Cabin near Davenport Gap- two days away. We said our good-byes for then at the top of the windy Newfound Gap and hiked two more days through the Smokys. Our last night was hopefully our coldest we have at a whopping 13 degrees!! I had on basically every clothing item I brought and even my emergency blanket on top- just in case ha! It surprisingly wasn’t as cold the next morning, but that could be because we didn’t have to put on wet socks. And the Smokys granted us with the most gorgeous day to hike out with. Hasta La Vista Great Smoky Mountains! Taking in the highway view while we wait on Kathy, glad to be in the sunshine! At Davenport Gap we called Kathy and she picked us up to take us back to her cabin where she treated us with pizza, beer, and apple cobbler!! We are so spoiled ? We sat around and watched “Thru-Story” by Jester O’Donnell and turned in way past our normal bedtimes. 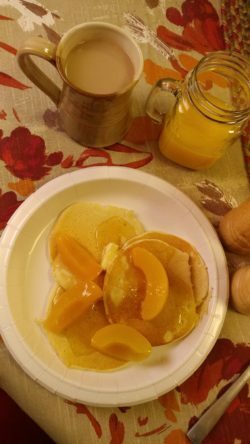 But that’s okay because we got to wake up and have peach pancakes for breakfast! Thank you Kathy for your amazing trail magic and generosity! We are headed to Hot Springs, North Carolina now with our bellies full and spirits high. Great update, cant wait to make it out there soon! As I said, several times, it was my pleasure! Hope your journey is a wonderful as mine was! Great job girl, God keeps blessing you and i know each step you take HE will be with you, So glad your having a great trip, we will be keeping up and hopefull to catch up with ya a little later. Just caught up with your blog. All I can say is Wow!. What an awesome journey so far. I have been so blessed by God to have met you and the others. Have done trail magic for 21 straight days. There’s not a single day I haven’t had the opportunity to mention you and you group. Mostly telling other hikers how incredibly disciplined you were in taking it easy in Ga. The Lion Heart came from a girl from Sweden about a week behind you. She’s fast…Rebecca is her name. Look forward to sharing your journey. God Bless and stay true!